Compassionate Action for Animals has launched a campaign to bring Meatless Monday to the University of Minnesota, Twin Cities’ University Dining Services. Please view and sign our online petition, and share with your friends! We want University Dining Services to adopt Meatless Monday by serving one entirely meatless meal (lunch or dinner) at all dining halls for the 2015-2016 school year. Additionally, we want UDS to serve one or two vegan main dishes at each dining hall, and to market that they’re doing Meatless Monday and why. If Meatless Monday is successful, continue it indefinitely. 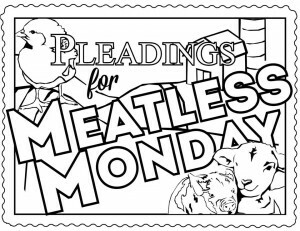 Meatless Monday is an international movement prompting people to reduce meat consumption by 15% in order to improve their health and the health of the planet. It was launched by the Monday Campaigns in association with the John Hopkins Bloomberg School of Public Health. Over 146 campuses world wide follow the guidelines of Meatless Monday, asking students to refrain from consuming meat and reducing the meat served in their dining halls one day a week. These campuses allow students the opportunity to explore and learn about vegetarian options. The current state of the University of Minnesota dining halls, while diverse and comprehensive in most aspects, does not encourage or enable a vegan or vegetarian diet. Not only is this a frustrating hindrance to vegetarian and vegan students who are required to purchase a meal plan, it is also a significant road block for other students exploring the health and global benefits of adopting a plant based diet. For every one pound of beef protein produced 10 pounds of plant protein are consumed in the process. If the grain fed yearly to livestock in the United States alone was instead fed to humans it would provide meals to 800 million of the 925 million people in chronic hunger worldwide. Approximately 1 billion people world wide are still without access to sufficient fresh water supply. An even larger population suffers from flooding, pollution and poor sanitation effecting their fresh water. Yet 2,500 gallons of fresh water are utilized to produce every pound of beef raised for human consumption. On the contrary, growing a pound of tofu requires only 220 gallons. Factory farming currently accounts for more greenhouse gases than all of global transportation combined. The use of fossil fuels on farms emit 90 million tons of CO2 every year. Additionally the obscene amount of waste produced and lack of effective waste disposal systems make up 37% of all methane (CH4) emissions world wide, a greenhouse gas which has 23x the global warming potential of CO2. The Environmental Protection Agency claims that this waste is also responsible for the pollution of groundwater in over 27,000 miles of rivers. On top of these startling facts, the use of 30% of the earth’s land for livestock is consequently the leading cause of rainforest deforestation as well as destruction of biodiversity. Research shows that reducing meat intake lowers your risk of chronic preventable conditions such as cancer, cardiovascular disease, diabetes, hypertension, and obesity. Multiple studies have shown that periodic health prompts lead to positive behavior change. Monday is the beginning of the week, making it the perfect time to reevaluate our choices and set our intentions for the coming days. With a Meatless Monday, you have a scheduled, recurring reminder to start your week off on a nutritious note.